Phrase trainer to help musicians learn, practice, transcribe tracks. Is there a better alternative to iRehearse Plus? Is iRehearse Plus really the best app in Music category? Will iRehearse Plus work good on macOS 10.13.4? iRehearse Plus is a music-practicing application that lets you manipulate audio passages to help you learn them more efficiently. Ever wish you could you could slow down music to hear a complex passage more clearly? Ever wish that slowing down a song didn't change its pitch so you could still play along? Ever wish you could loop over a small section of a track and practice it again and again until you get it just right? iRehearse Plus allows you to do all of this and more! Change the Pitch of a Song: Pitch shift a song without changing the tempo. Ideal if you need to tune a track to your instrument, or prevent the need to re-tune between tracks when rehearsing. Change the Speed of a Song: Adjust the tempo of a song without changing the pitch. This allow you to practice that complex solo or riff at a slower speed without re-tuning your instrument. If you really want a challenge, you can even speed up the audio and play at twice the speed! Loop a Section of a Song: Mark up to five sections of the track to loop. Practice that tricky section again and again until it's perfect. Of course all pitch and tempo adjustments work on loops too. Detailed View: Zoom in on waveforms and really get to grips with that tricky section. Drop markers, make quick loop selections and toggle the loop countdown. 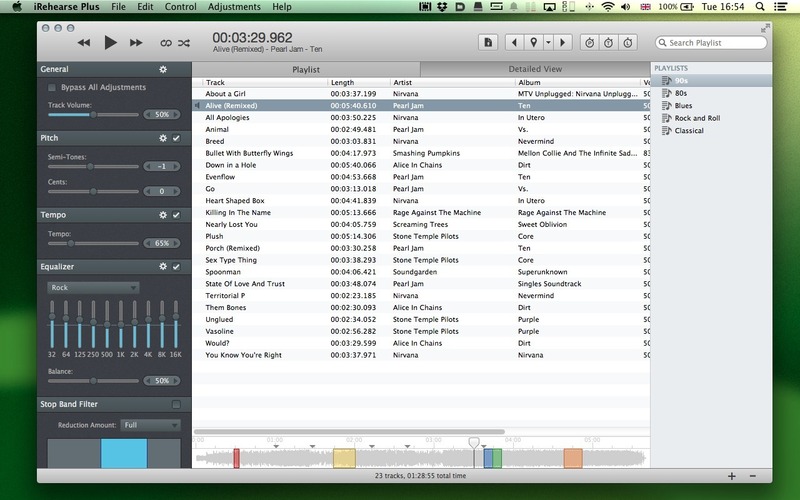 Multiple Playlists: Create as many playlists as you need and quickly switch between them using the Playlist Library.